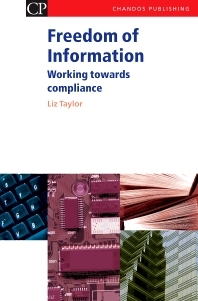 As from 1 January 2005, Freedom of Information (FOI) legislation will come fully into force throughout the UK and could potentially change the way in which the public sector manages information. This report provides practical advice on how to achieve compliance with the Acts; the report helps to ensure successful management of the key risks that the Acts may pose to organisations across the UK. The report also introduces some of the change management issues that will need to be addressed within organisations to facilitate the transition to a more open culture of FOI. Liz Taylor has worked in the knowledge and information management field for the past eight years.